Shamoya McKenzie was on top of the world as she left midday basketball practice on New Year’s Eve 2016. The 6-foot-2 middle-schooler had just learned she was moving up to the high school varsity and her mother had promised to buy her a new pair of sneakers and a new phone. 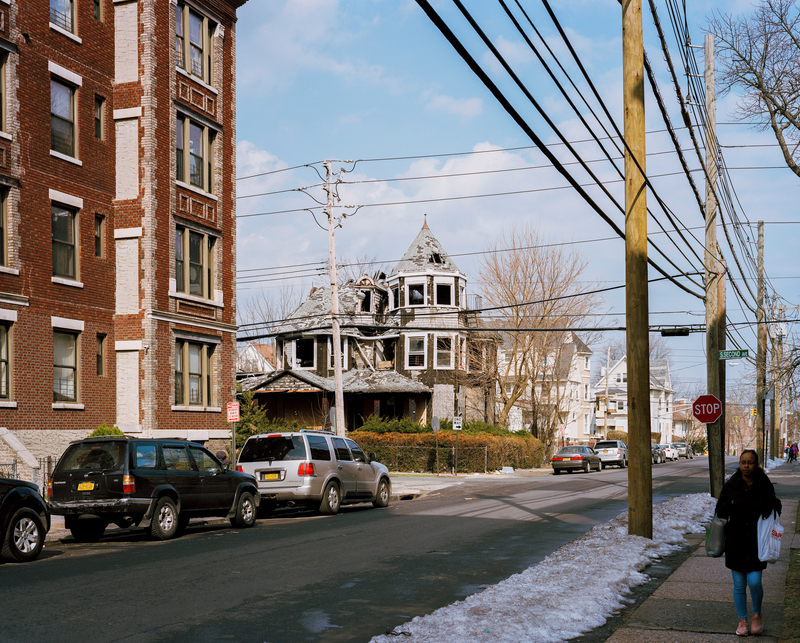 Mother and daughter chatted excitedly as they drove home through the narrow streets of Mount Vernon, New York. Before long, traffic slowed and a car cut them off. Then a guy got out and started shooting at a man down the block. “I heard the sound,” Nadine McKenzie recalled, “but I was able to drive off.” She pulled her aging Toyota Camry around the corner and glanced at her 13-year-old daughter, who was slumping toward her from the passenger’s seat. “Stop playing, Shamoya,’” her mother said. Then she looked closely and saw that her daughter was bleeding. A bullet had pierced the car’s back passenger side window, striking Shamoya in the head. McKenzie jumped out of the car and flagged down help. Shamoya was rushed to the hospital, but there was nothing doctors could do. Word of the shooting spread quickly through Mount Vernon, a predominantly black working-class city just north of the Bronx. The Rev. Hugh Marriott, whose daughter had played Catholic Youth Organization ball with Shamoya, got a text message asking him to go to Montefiore Mount Vernon Hospital. He put on his clericals and rushed over. As he approached the entrance, Marriott recognized faces from the city’s youth basketball circuit. An illustration of Shamoya McKenzie’s basketball jerseys and a poster of Shamoya in Nadine McKenzie’s bedroom. It is the kind of senseless tragedy Marriott has seen too frequently in Mount Vernon: one black person killing another. And that problem, he said, needs to be addressed head-on. In August 1979, venerable Ebony magazine published a 162-page special issue dedicated entirely to the problem of “black-on-black crime.” In a note to readers, John H. Johnson, the founder and publisher, explained that rampant crime was making too many black communities “beleaguered and fearful places.” He noted that blacks were much more likely than whites to be crime victims, and that most of the perpetrators of crime in black communities are black. Decades later, those racial gaps persist, even as overall crime rates have declined sharply. The disparity is perhaps most disturbing when it comes to murder. In recent decades, African-Americans were six times as likely as whites to be homicide victims, according to Justice Department statistics. The carnage is staggering: 2,491 African-Americans were homicide victims in 2013, the most recent year for which FBI statistics are available. An estimated 93 percent of those murders were committed by other African-Americans. The 2013 toll alone is equal to 72 percent of the 3,446 lynchings documented by Tuskegee University researchers between 1882 and 1968. The comparison to nearly a century of deadly racist terror only underscores the alarming scope of the problem. But in the age of Black Lives Matter, when many activists and leaders are focused on policies to reverse mass incarceration and stamp out police violence against African-Americans, the phrase “black-on-black crime” has taken on a new, more pejorative meaning. It is no longer seen as a description of a devastating problem that preoccupies many everyday African-Americans, but as a racial insult. Critics say the term conjures images of black criminality while avoiding any mention of crime’s root causes, such as poverty, structural racism, a lack of jobs or hypersegregation. Besides, they argue, nobody talks about white-on-white crime. Street scene of East 4th Street and South 2nd Avenue. It matters which words are used, they say, because they define the problem and point the way toward solutions. If people talk about “black-on-black crime,” rather than, say, inadequate schools or a lack of job training in poor communities, then the policies they support are likely to miss the mark. But others worry that, given the destructive impact of high crime rates in many black communities, avoiding the term is like ignoring the proverbial elephant in the room. The realities of poverty, lack of opportunity and racism stand apart from the scourge of crime, they say, noting that most people in impoverished communities do not resort to lawlessness. Banning the term “black-on black crime,” they say, has the effect of cutting off discussion of perhaps the most pressing problem confronting many African-American communities. Most of all, he remembers a neighborhood of hardworking people who harbored seething contempt for the relative handful of hoodlums among them. Historically, he explained, African-Americans have stood together against white supremacy, making what he still calls black-on-black crime an especially egregious violation. Former three-term Baltimore Mayor Kurt L. Schmoke, now president of the University of Baltimore, tried to make a similar point when speaking on a panel about police brutality at the National Urban League convention last summer. But he was all but shouted down. “If you talk to the majority of black voters and homeowners in the neighborhoods about their public safety concerns, they would probably raise black-on-black crime as a bigger concern than police brutality,” Schmoke said. Tribute posters for Shamoya Mckenzie made by the students of Graham Middle School, where she attended since the age of 4. But the reaction of the largely black audience was audible, and mostly unfavorable. A fellow panelist said that his point was akin to blaming African-Americans for their own pain. The moderator turned on him too, arguing that the phrase makes no sense, since white folks kill white folks, Hispanic folks kill Hispanic folks, and Asian folks kill Asian folks. “Not in those numbers,” Schmoke interrupted. Looking back, Schmoke is not apologetic. “It does seem to me that it’s appropriate to highlight the fact that our young African-American men are killing one another at a higher rate than anybody else,” he said. These days, people more frequently rely on less evocative terms to describe the same problem. They talk about “urban crime,” “crime in poor areas,” “inner-city crime,” “proximity crime,” or just “crime.” But Schmoke is among those who finds all of the substitutes unsatisfactory. 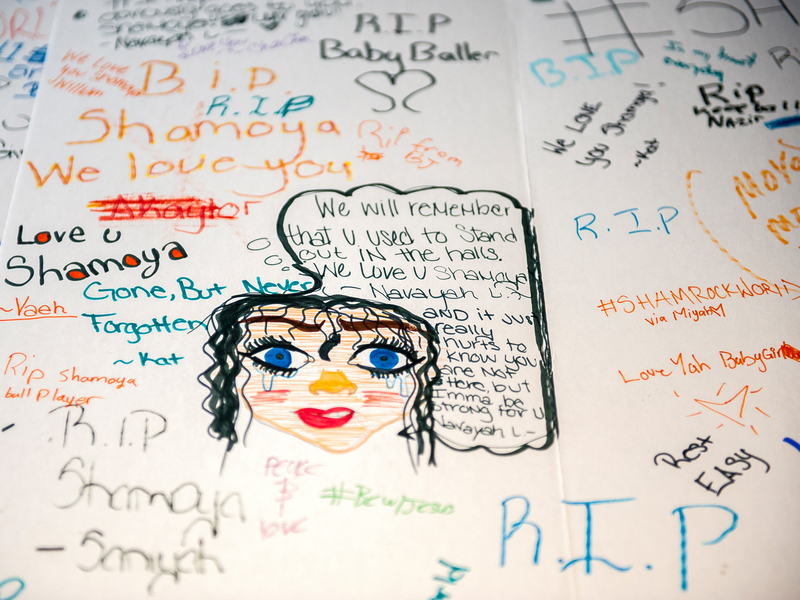 Local leaders in Mount Vernon are hoping that Shamoya’s death marks a breaking point. Her killing has triggered an outpouring of support and activism that has bolstered her grieving mother and left many in the city determined to stand together against crime. The day after her murder, people gathered at Mount Vernon High School to release balloons in her honor. Hundreds of mourners packed her funeral. Strangers sent so many spectacular flower arrangements that a separate van was needed to transport them to her gravesite. The funeral director went above and beyond, providing a horse-drawn, glass-enclosed carriage for Shamoya’s casket. Youth teams from neighboring cities helped raise money at their games, and a GoFundMe page brought in more than $31,000 to help Shamoya’s mother. The basketball team from her dream school, the University of Connecticut, declared her an honorary member. Also, her former AAU coach and other coaches have launched the Shamoya McKenzie Foundation to fund youth programs and scholarships in Shamoya’s memory. A few days after Shamoya’s funeral, police arrested David Hardy, now 22. They said he was gunning for a 29-year-old gang rival when he accidently cut down the budding basketball star. He has pleaded not guilty and is awaiting trial in the Westchester County Jail on charges including second-degree murder. His arrest brought both solace and sadness. People were relieved to know that a suspected killer was off the street. But at the same time, his backstory only compounded the tragedy and made any lasting solutions to violence feel all the more elusive. Weeks before the shooting, Hardy had lost a part-time job in the city’s recreation department because funding for the post had expired. He had gotten the job only because he failed to disclose a 2012 robbery conviction. Just two days before Shamoya’s murder, a warrant was filed against Hardy for sending a string of texts threatening to shoot up his former girlfriend’s house, and to shoot her father. Worse, he was not some stranger to the city. Instead, Hardy was every bit a child of Mount Vernon. He had once gone to Graham Elementary School, the same K-8 school that Shamoya attended. Also, he came up playing basketball with the Mount Vernon Junior Knights, the club where Shamoya got serious about the game. “The shooting took on a double meaning for us, because we had coached him too,” said Dwayne “Coach D” Murray, program director for the Mount Vernon Junior Knights. (Left) A tribute banner for Shamoya Mckenzie at Graham Middle School, where she attended since the age of 4. (Right)Dwayne Murray, the Director and coach for the Junior Knights, at the First United Methodist Church where Shamoya McKenzie played a part of the boys team. Dwayne Brown, an event planner who has run several youth programs in the city and heads the Mount Vernon Chamber of Commerce, also knows Hardy. That question is being asked with new urgency since Shamoya’s death. More than ever, city leaders and others say there is real talk about ways to end the drumbeat of violence they had come to tolerate through the years. Less than a week before Shamoya’s murder, O’Neill Bandoo, a club owner and father, was killed and five others were wounded, allegedly by a man who was angry for being kicked out of Bandoo’s club. All of the victims, as well as the alleged shooter, were black. “Enough is enough,” said Mayor Richard Thomas, 34, who was born and raised in Mount Vernon. He called Shamoya’s death especially devastating because of her innocence and her vast potential. She was an honor roll student and her coaches thought she had the tools necessary to earn a Division I college scholarship. Thomas is pushing on multiple fronts to fight crime. He wants to get more police officers on the street and strengthen the city’s recreation programs. He is also working to pull together the millions of dollars it will take to renovate Memorial Field, a 10,000-seat stadium near downtown that used to host high school football games and once hosted a Jackson Five concert. In recent years, it has been used mainly as an illegal dump. A lack of money hampers all those efforts. For now, the city is building a Wall of Legends that will hide the eyesore that the field has become and honor some of the city’s sports heroes with colorful murals. Late Major League pitcher Ralph Branca; former NBA stars Earl Tatum, Ben Gordon, Scooter and Rodney McCray, Gus Williams and his late brother, Ray Williams; and 2016 Olympic sprinter Deajah Stevens, are among the famed athletes from Mount Vernon. One year when he was in high school, Thomas said, eight people he knew were killed in the streets. He did not get caught up in that madness mainly because of sports. He caddied at local golf courses and played football, basketball and golf in high school. Before graduating, he got interested in business, which eventually propelled him to a master’s degree in business administration at New York University. “We’re a black city and black communities need to succeed, not get lost in self-defeat,” Thomas said. 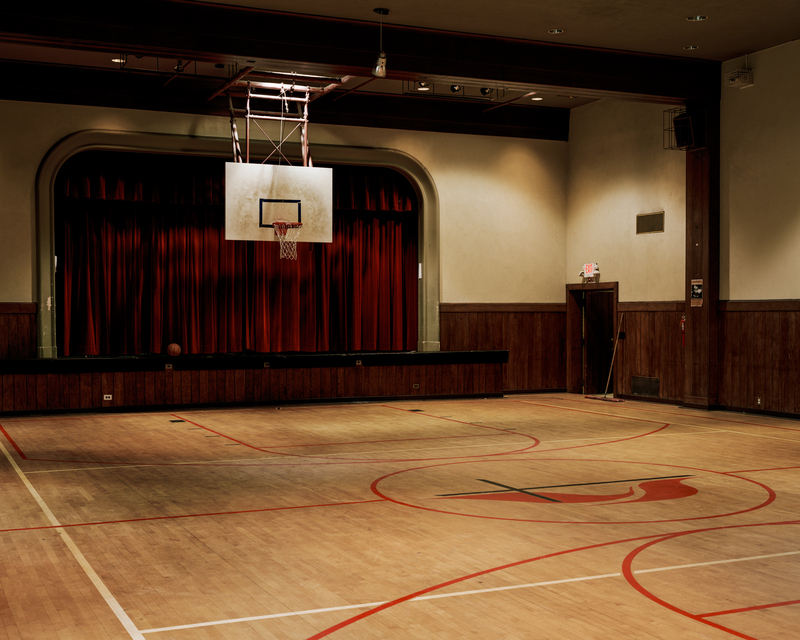 The Junior Knights gym at The First Methodist Church where Shamoya McKenzie first played. Shamoya was a 13-year old star basketball player that was shot and killed last year.